and go for a ride. which forms the basis of typical thread per connection model found in most web servers. intensive with high context switching costs for a highly concurrent load. and back irrespective of whether some data was read or not. would block until at least on of the registered file descriptors become ready. the exception than the norm. mode is what usually known as the “Non Blocking I/O” model. one by one using the application specified event handlers. // a connection was accepted by a ServerSocketChannel. // a connection was established with a remote server. from device to kernel buffer and finally to the application level buffer? mode. For this it is required the operating system support AIO operations. is present in the form of “I/O Completion Ports”. required to be repopulated from a separate copy. Not an elegant solution at any rate. is data to be read. Windows equivalent is “I/O Completion Ports”. Windows seems to support this first class again via “I/O Completion Ports”. them first so it would be easy to understand the diagram. handlers are run in different threads from a thread pool. demultiplexer which encapsulates connection channel and readiness information. operation. Java NIO equivalent is SelectionKey. connection channels. Java NIO equivalent is Selector. acceptance protocol from the passed Handle. 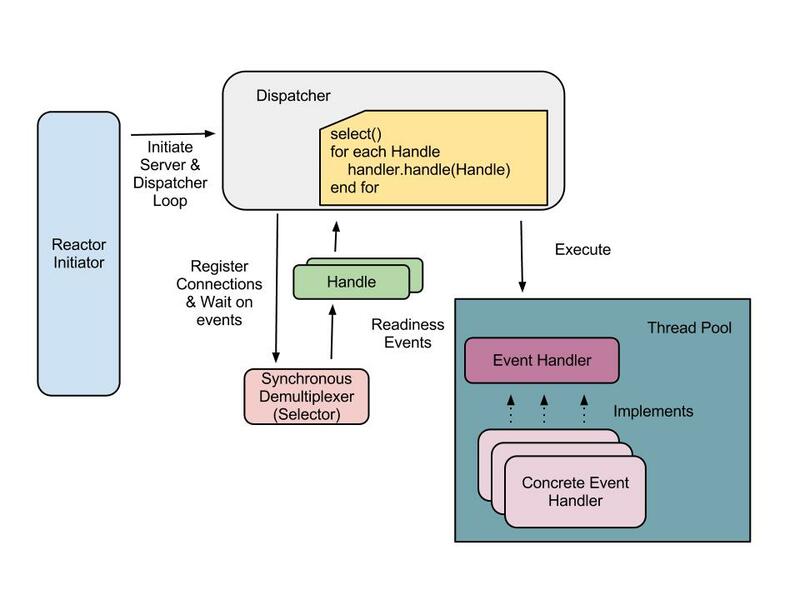 Event handlers are typically run in separate threads from a thread pool as shown in below diagram. A simple echo server implementation for this pattern is as follows (without event handler thread pool). This pattern is based on asynchronous I/O model. Main components are as follows. handle connection acceptance asynchronous event notification. interface exposed by Operating System. by the Asynchronous Operation Processor in separate kernel threads. according to the type of the event. 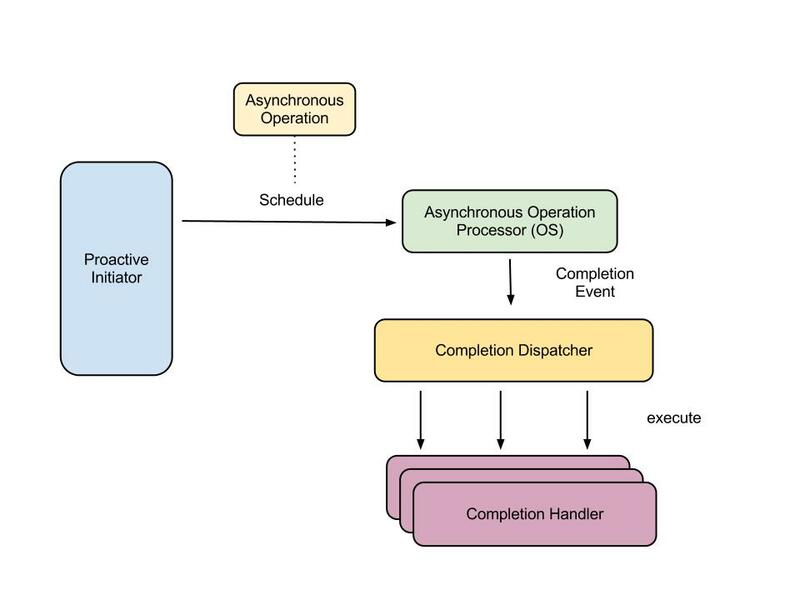 Let’s look at how this pattern can be implemented (as a simple echo server) using new Java NIO.2 API added in Java 7.
hold client session specific state across a series of completion events. If you are thinking of implementing a NIO based HTTP server you are in luck. which returns a dummy output for any GET request is given below. // i.e. for the listener to start accepting requests. 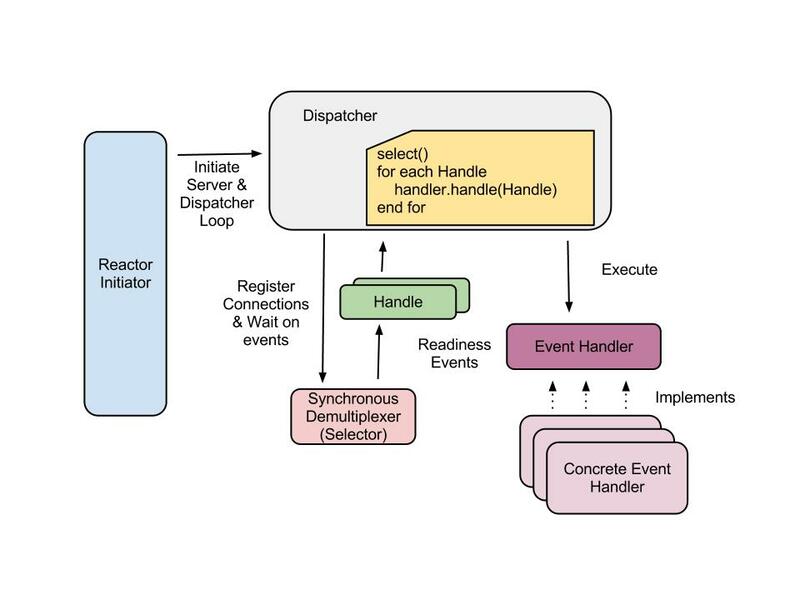 ServerHandler implementation handling readiness events. of clients per instance with rather constant memory usage over time. collection mechanisms built in along with Axis2 transport framework integration. It can be found at . outlined in the post along with clients can be downloaded from here. There were many references I went through in the process. Below are some of the interesting ones.